Having a conversation with a very dear Cuban friend about an accompaniment for the traditional Cuban dish of Ropa Vieja I was making for someone who doesn't eat rice (my dad), he suggested a mixture of mashed 'normal' and red sweet potato. 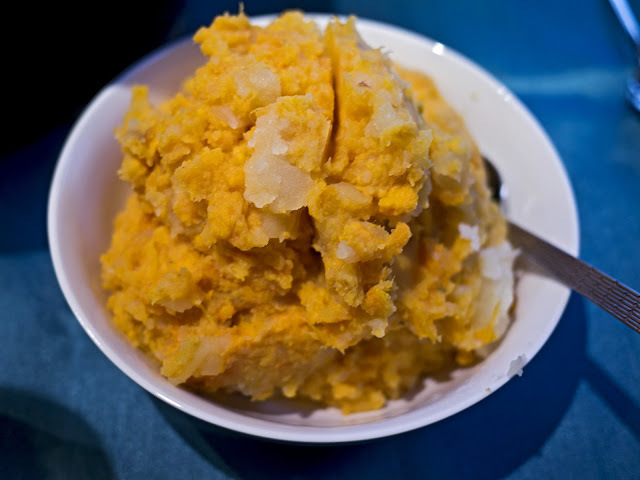 Of course, my friend would use lots of butter in the mashing – as would I if I wasn't trying to lose weight – but I have adapted it to suit the Slimming World plan. Boil the potatoes separately until both are cooked, then mix in a large bowl and mash with the bouillon powder using a potato masher. This dish makes a nice change from the more regular mashed potato, and even Husband, who is not a great lover of sweet potato, enjoyed it served this way.